Another central agency changes hands as I learn that the 32m motor yacht Mastiff is now for sale with Yachtzoo in Monaco. She was built by Appledore Shipbuilders in 1967 as a deep sea tug and converted into a luxury superyacht in 2010. With a tasteful interior and in turnkey condition, Mastiff sleeps nine guests in five cabins and cruises at 10.5 knots. 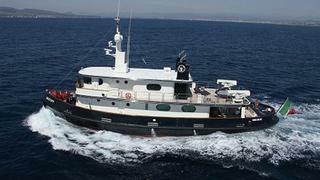 Available for inspection in Genoa, Mastiff is asking €3.2 million.